A bio poem is a simple poem written about a person, and it follows a predictable pattern. You can have students write Bio Poems about themselves, but later you can have them write about famous historical figures or book characters. This lesson includes directions, graphic organizers, a Bio Poem planning page, a sheet of decorative writing paper, and an example bio poem. Looking for a terrific writing activity that also serves as a back to school icebreaker? Check out Buddy Bio Poems! More Poetry Resources from Laura Candler! All of the poetry resources listed below are included in my Poetry Combo, and you'll save over $5 by purchasing the combo instead of the individual items. Exploring Poetry offers fun and engaging strategies to teach kids about poetic devices and how to read and interpret poetry. Click Exploring Poetry: Tools for Teaching Kids to Read and Understand Poetry to take a look. Buddy Bio Poems is a fun writing activity for partners in which students interview each other and then write a bio poem about their partners. 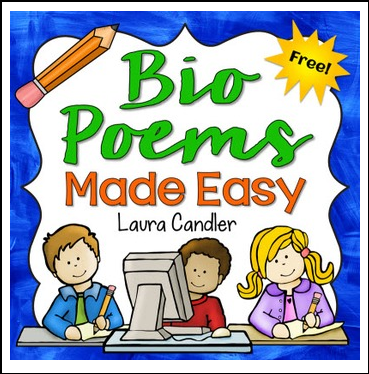 Click Buddy Bio Poems to take a look! Writing Poetry is a complete set of lessons for creating a poetry workshop in your classroom where students learn to write free-verse poetry. Click Writing Poetry: Teaching Kids to Write from the Heart to check out this book. Crafting Comparison Poems is the newest addition to this Poetry Combo, and it includes a series of step-by-step lessons and ready-to-use printables for teaching kids to write similes and metaphors and craft poems from them. Click Crafting Comparison Poems: Teaching Kids to Write with Similes and Metaphors to learn more.